Looking for warm summer getaway with all kinds of fun outdoor activities? Or how about world class skiing/snowboarding in the winter? This house/cabin has it all! Keywords: Looking for a fun retreat? This house has it all. Near Deschutes River for fishing, kayaking, bike riding, river rafting. Just imagine sitting on the deck watching the deer run by with views of snow covered Mt. Bachelor off in the distance. Calm, country feel yet 5 minutes from shopping and restaurants! 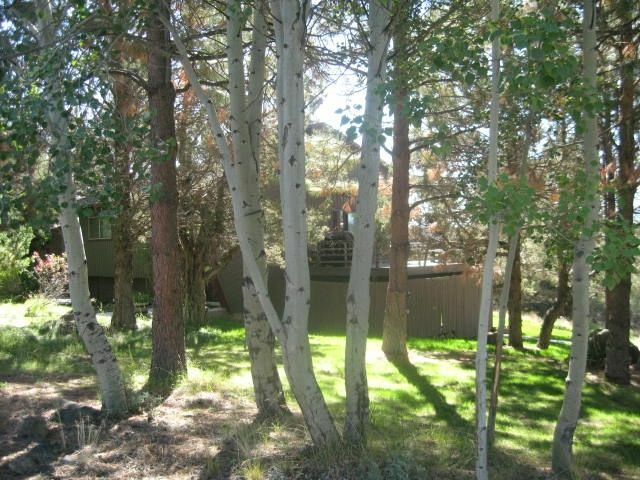 ¾ acre property on a quiet cul-de-sac just above Tumalo State Park and the Deschutes River for the best kayaking and fishing all within walking distance. Just above popular bike route for cycling enthusiast or to watch the many riders going by. You will enjoy your stay at this cozy home just 15 minutes from Redmond airport. Enjoy peaceful strolls on several walking, hiking, biking trails along with River below. Near Old Mill District, Drake Park, Downtown Bend. 40 minutes from Mt Bachelor, great restaurants and everything else beautiful Bend has to offer. This home is in the perfect location and is well equipped throughout and very comfortable! We are a semi-retired couple with 4 grown kids. Bought this home after visiting our daughter who married and moved to Bend. Fell in love with the area, especially because we are so close to town, yet have a peaceful, quiet retreat away from our sometimes crazy life! My husband coaches football and I'm a paralegal. Love sports and travel. Now our entire family visits often with the grandkids whenever we can. We fell in love with all the fun activities to do in the summer and the snow in the winter. All the best shopping and restaurants within 15 minutes from our little country getaway. We keep discovering new fun places every time we go up there for hiking, sightseeing, fishing, kayaking...the list goes on! Environmentally friendly pellet stove that is a bit temperamental at times! Coffee/tea/hot cocoa, spices and other items available. Outdoor dining chairs, tables, benches. Heat lamp and fire bowl. On sunny days, fully retractable awning. Roomy & comfortable, especially convenient for two couples due to upstairs/downstairs configuration. The views are great, there is plenty of privacy and, most of all, the owner was wonderful to work with before & during our stay! We loved staying in this well cared for family home! Convenient for exploring Central Oregon, lovely views & comfortable furnishings. The owner is especially kind! Thank you for a wonderful holiday getaway from Florida to the beauty of Bend, OR! Thank you for the nice review! I sincerely hope your stay was everything you were looking for. Thank you for choosing our home. Happy 2019! Great property with all the amenities. A wonderful home with everything you need. Very spacious, clean, and comfortable. The neighbors are extremely noice conscious yelling at us about our children playing in the yard at noon and also going for an evening walk. I would not reccomend for anyone with children who like to play outside or go for walks. Other than those couple encounters with a grumpy neighbor, we had an amazing trip. You should not feel the need to worry about our grumpy neighbor. My grandkids play in the yard all day long. Kids are welcomed and enjoyed in our neighborhood with the exception of that neighbor. Some people are just grumps no matter where you go. Sorry if she interfered with your kids playing, but happy you enjoyed your stay! Great place to bring a family!!!! The property was beautiful, very comfortable roomy and well supplied. Great communication on property and support. We loved the location. Hope to get to come back. Great guests. The house is set up to make everyone’s stay comfortable and relaxing. Come back again! Our family enjoyed the peaceful setting of this beautiful home! We wish we could have spent more time enjoying it! Everything we needed was there and it was wonderful to "come home" to after a busy day if activities! We hope to return in the future! Thank you for your lovely review. Return again and enjoy more time here! Everything was perfect in the cabin. Very comfortable. Everything we needed for a relaxing stay. Beds were very comfortable. Deck was outstanding for just sitting and taking it all in. We didn’t utilize the grill since there were so many good eateries and brew pubs in Bend. Bend is a wonderful town for foodies and breweries, as well as all the fun things to do in Bend. We try to make the house super comfy for guests returning from a busy day of from all the fun! Just like coming home. Come back again! Bend offers concerts, festivals, music and movies during the summer, and 40 minutes to great skiing in winter. 10% discount for 7 nights or negotiated fee for 2 weeks or more. High season rates of $175/night apply for holidays (Thanksgiving, Xmas, New Years, Spring break, etc.) Please also note if you use the VRBO Pay Now option, you will be charged 2.5% on total fees by VRBO. Option of paying by check to owner in full without these charges. Otherwise, 2.5% will be deducted from security deposit. NO PET POLICY. Extra fees may apply if you bring pets.